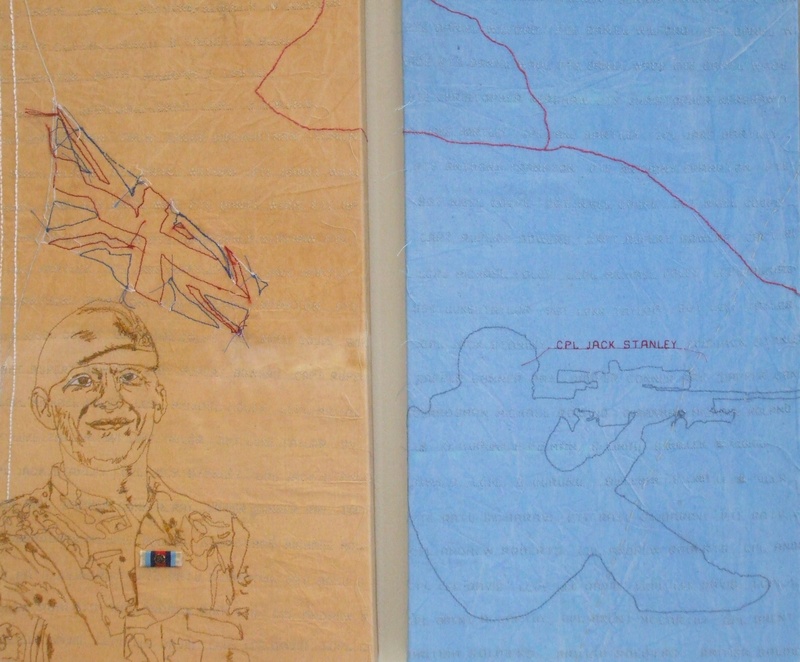 In 2012 Karin, a Hampshire based textile artist, used the Uniforms of British Soldiers as a catalyst to explore the deeper meaning and consequences of the War in Afghanistan. Using the colours of the campaign ribbons awarded to returning troops, she explored the individual soldier’s journeys using maps, military equipment and uniforms. Through personal circumstances she understands the frailty of human life and her work highlights the cost in human tragedy of each devastating loss. She personalizes in her work the sacrifices that are being made on our behalf. Each single French Knot stitched with a long strand of red thread represents a life lost in the conflict. Whether a single thread on a work, or a carpet of threads, the viewer is asked to share the loss felt by the families of these young soldiers. “I began to explore images and silhouettes of soldiers that I had found either on the Internet or that I took from television programs. These were powerful and moving images that I wished to explore and utilize in my works. I decided to draw the outlines of soldiers on the list of the dead soldiers”. “The images and silhouettes that I have created in my work represent the soldiers that are no longer with us, it is as if they have become invisible. They have been here on earth, have shared love and joy and have made a lasting impression, yet they can no longer be seen”.